Small - $39.99 Only 1 left! Medium - $39.99 Large - $39.99 X-Large - $39.99 Only 9 left! Your parents were always saying not to monkey around. But that’s a bummer. Monkeying around is the best kind of fun and who are the adults to say we can’t have fun? Well, now we are the adults and we can make the rules – and break them – however we want! Whether your idea of monkeying around is throwing a loud party or eating too much candy and jumping on the furniture, we want to help you realize your childhood fantasies! Go to the store and stock up on bananas (or candy and soda), or get some party supplies and get ready to monkey around like you always wanted. 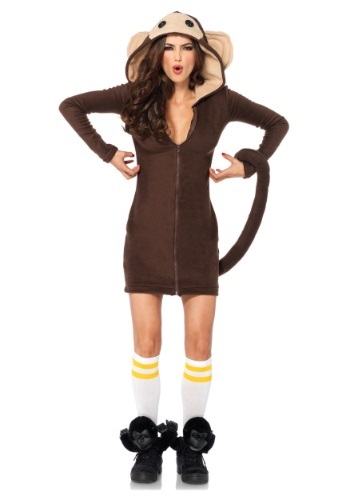 It doesn’t even have to be Halloween to swing from the chandeliers – you can dress up in this women’s monkey costume any time of the year. And don’t monkey around on your own – getting into mischief is always more fun with friends – so invite some of your favorite monkey pals over to your neck of the jungle to hang around and make a mess! You'll have more fun than a barrel of monkeys when you wear this Cozy Monkey Costume! It's made of 100% polyester soft fleece and has a soft-sculpted monkey face on the hood. The long-sleeve sheath dress has a center-front zipper and a long, stuffed tail is sewn to the back of the dress. A cute banana applique adds a unique touch to this monkey costume. 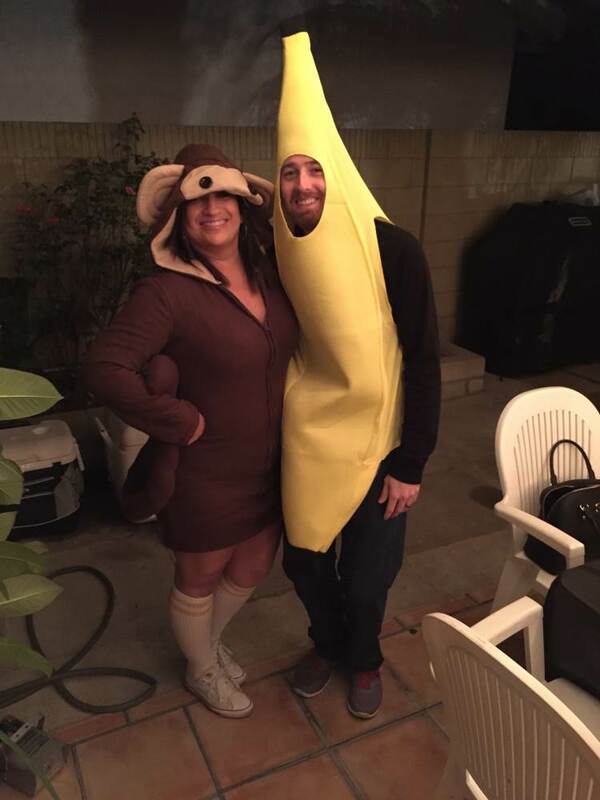 Feel free to go bananas in this unique adult monkey costume for Halloween! The hood is too big. It never really sat correctly on my head - even after I folded and safety pinned it back. I felt like I couldn’t see and according to my husband, I was fussing with it all night. I attached a picture of how low the hood covered my eyes - keep in mind this is AFTER I safety pinned it back. Its such a shame, because the costume is soooo cute! I'm 5-5 with a fairly large bottom and this costume felt snug and short.